Billy Lee has been a highly respected professor of art at the University of North Carolina at Greensboro since 1984, and is a sculptor of international reputation. Born of Chinese and Dutch parentage in South Africa and educated in England, he received his MFA at the Royal College of Art in London. Lee is the only visual artist ever to receive the prestigious award of a Kennedy Scholarship, which allowed him to study as a research fellow at the Massachusetts Institute of Technology. 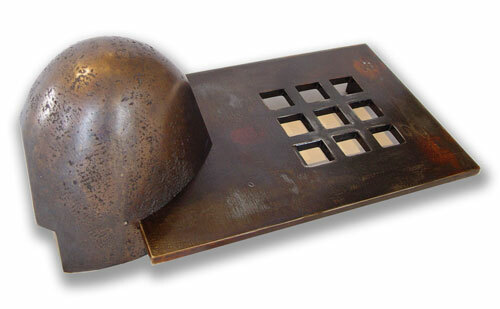 A work of steel and bronze, Untitled, combines the hard with the organic. A flat slab of steel with an industrial feel and grate-like openings intersects a soft, curving mound. Lee has taken an inert hard material and transcended that hardness by sculpting it into something that is sensuous without being figurative. He is interested in the idea that from such a simple form, you can obtain sensuousness. Lee’s numerous past awards and his distinguished exhibition record are evidence of his devotion to sculpture. His work has been shown around the globe, from Greensboro to Japan, China, Hungary and the UK. He received the Giacomo Manzu Special Prize at the 7th Henry Moore International Sculpture Exhibition, as well as the Rodin Prize at the Fujisankei Biennale.